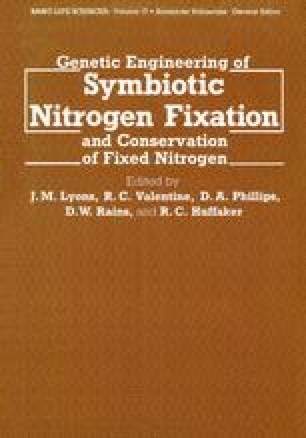 Although the role of light in nitrate assimilation has been studied extensively (Beevers and Hageman, dy1969, 1972), controversy continues as to whether nitrate reduction normally occurs in darkness. Nitrate reduction under anaerobic conditions has been reported in tissue slices in darkness; it was detected as nitrite accumulation in the medium (Atkins and Canvin, 1975; Klepper et al., 1971; Radin, 1973; Sawhney et al., dy1978a,b). Under aerobic conditions, however, nitrite does not accumulate in the dark (Aslam et al., 1979). That observation has been ascribed to two contradictory processes: 1) that O2 inhibited nitrate reduction (Atkins and Canvin, 1975; Sawhney et al., dy1978a,b); or 2) that both nitrate and nitrite reduction occurred in the presence of O2. This contradiction can be resolved by following each of the processes involved: nitrate uptake, accumulation, and reduction or at least the disappearance of the product (nitrite). When the appearance of nitrite is the only assay, it is not possible to determine whether nitrate reduction was inhibited by O2 or whether nitrite was further reduced. Either case would account for the inability to find nitrite in the incubation medium. Others did not find proof that 15NO3 − converts into amino acids in barley leaves in darkness during short-term experiments (Canvin and Atkins, 1974). The purpose of this report was to describe nitrate and nitrite assimilation by barley seedlings in light and darkness.